A.K.A. Union 2nd North Carolina Mounted Infantry Regiment; 2nd North Carolina (Federal) Mounted Infantry; 2nd North Carolina Mounted, U.S.A. The Union Army recruited two mounted infantry regiments within North Carolina, and both units, the 2nd North Carolina Mounted Infantry and 3rd North Carolina Mounted, were raised principally from Western North Carolina counties. 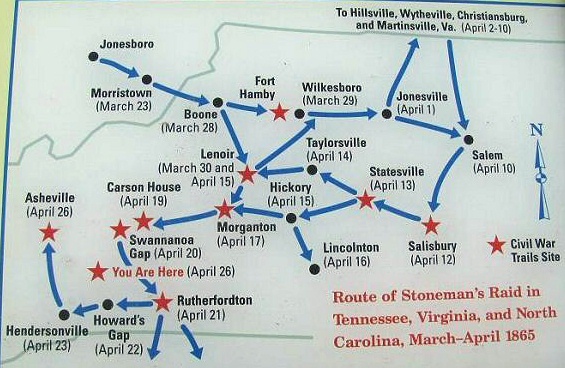 Although the men who comprised the Federal 2nd North Carolina were recruited from Western North Carolina and East Tennessee, Confederate deserters also formed a fraction of this unit. Recruitment of these regiments epitomized the Brother's War and the men serving in these two Union units were commonly referred to as Home Yankees and tories (after the Loyalists who sided with the British during the American Revolution). Union Major General George Stoneman's command as it concerns Western North Carolina in 1865: Second North Carolina Mounted Infantry Regiment, Lieut. Colonel William C. Bartlett; Third North Carolina Mounted Infantry Regiment, Colonel George W. Kirk; First Brigade, Commanding Colonel Chauncey G. Hawley; Fourth Division, Department of the Cumberland, Brig. General Davis Tillson; District of East Tennessee, Major General George Stoneman. To view entire Union District of East Tennessee, including 1st and 2nd Brigades, and Brig. Gen. Gillem's Cavalry Division, see O.R., 1, 49, pt. II, pp. 538-539*. On April 19, 1865, according to Official Records 1, 49, pt. II, pp. 407-408, Brig. Gen. Davis Tillson, commanding IV Division, Department of the Cumberland, and of Stoneman's Cavalry Raid, ordered Colonels Bartlett (Union 2nd North Carolina Mounted Infantry) and Kirk (Federal 3rd North Carolina) to advance through Western North Carolina and suppress the remaining Confederate forces in the mountains. General Tillson had attended the U.S. Military Academy and because of a severe foot injury his foot was amputated and subsequently he left West Point. Lieutenant Robert T. Conley and Company F of Love's Regiment, Thomas' Confederate Legion would soon engage Colonel Bartlett's 2nd North Carolina Mounted Infantry at Waynesville. And during the night of May 6, 1865, while Bartlett and his men enjoyed the spoils of Waynesville, they would find themselves surrounded by both the Cherokee Battalion and Love's Regiment. Lieut. Col. Bartlett, a New Yorker and commanding colonel of the Union's 2nd North Carolina Mounted Infantry, was ordered into the mountains south of Asheville to intercept and destroy Thomas' Legion, while Col. Kirk, Union 3rd NCMI, was to suppress Rebel forces to the mountains north of Asheville. Bartlett's forces advanced the French Broad River and almost captured Asheville, but "without the prompt and vigorous steps taken by Colonel G. Westly Clayton" and the 62nd North Carolina Infantry, Asheville would have been captured. General Martin ordered Lt. Col. Love and the infantry regiment to hold the Swannanoa Gap against the enemy approaching from Salisbury. In preparation for the Union assault, Love ordered the regiment to cut down trees as a defense, known as an abatis, and it was a good ambush. On May 4, 1865, General Davis Tillson ordered Lt. Col. William Bartlett and the Union's Second N.C. Mounted Infantry to Waynesville (O.R., 1, 49, 1, 339). 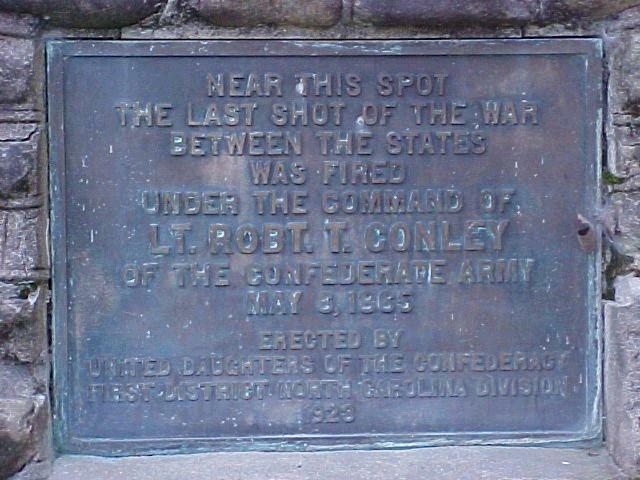 On May 6, 1865, 23 year old Lieutenant Robert T. Conley's small company of 20-25 men of Thomas' Legion smashed into Bartlett's regiment while advancing through the woods in White Sulphur Springs, N.C. While Conley was forwarding his detachment through the woods to link up with Love's Regiment, Thomas' Legion, it collided with Bartlett's regiment causing both sides to press the initiative. Conley's unit was however a sharpshooter company that had fought and tramped under Early during the Shenandoah Campaigns of '64. The proven men had quick, steady hands and were crack shots when they introduced themselves to the Union 2nd North Carolina. The sharpshooters fired a single volley into Bartlett's troops, who had been scattering because the Rebs had formed and raised their firearms quickly. It resulted in the Union regiment retreating, but without one of its soldiers. In the Civil War the last man killed east of the Mississippi River was an unfortunate Union soldier named James Arwood at White Sulphur Springs. After the conflict, Mr. Conley was known as the Confederate who often said that "I still have James Arwood's gun as a relic." The Last Shot should also be defined as the last Union and Confederate forces in combat east of the Mississippi and should not be viewed or confused with the Union Army fighting bushwhackers and outlaws. Colonel Thomas, commanding Thomas' Legion, now 60 years young, was of short stature, as a boy adopted by a Cherokee chief, bilingual, a self-taught attorney who had fought and secured the rights of the Cherokee in North Carolina, a former state senator, businessman, and current Chief of the Eastern Cherokee. Thomas, who now donned a hat that was one-half Confederate colonel and the other Cherokee chief, ordered an articulate young man, Private John S. Rice, to exchange his Confederate uniform for civilian clothes, and then told the young Rice to infiltrate Bartlett's camp and to exaggerate and profess that a large Confederate force is located in the "Balsam Mountains to the south, and in the Smoky Mountains to their west, and in the New Found Mountains to the north." Later that night Chief Thomas had the Cherokees build hundreds of small bonfires in the surrounding mountains and then perform their customary dances. The war dance, known as the "te yo hi", was accompanied with their chilling "war whoops" until the morning of May 7th. The activity was created to make an impression that there was a massive Confederate force poised to converge on the much smaller Union force. The intimidating "Cherokee War Whoops and Dances" were common practice in Cherokee War Rituals, and on May 6-7 the rituals were employed as psychological operations crucial to the following serious of events. Early on the 7th, Thomas received news that Lee had surrendered to Grant during the previous month and that Johnston had surrendered to Sherman in late April. The war was over, well, at least for the rest of the nation, but this was highland country, and although Lee and Johnston had surrendered, Thomas too had his own terms. On May 7th Colonel Bartlett was convinced that the mountains were filled with a massive Confederate force and a rather unknown quantity of savages desiring scalps, so a flag of truce was exchanged quickly with Thomas. Some reports state that Thomas initially sent the flag, while other reports indicate that Bartlett eagerly forwarded the flag in order to broker an agreement. The outcome however is concrete (see O.R., 1, 49, pt. II, p. 669), and there is evidence that Bartlett believed that he was confronted by superior numbers. According to Official Records of the Union and Confederate Armies, April 10, 1865, Union Maj. Gen. D. S. Stanley believed and recorded, "Thomas' Legion consisted of 800 infantry, 400 Indians, 1 four-gun battery with 150 men, and about 450 cavalry, and were stationed at Quallatown, North Carolina" (O.R.,1, 49, pt II, p. 309). Confederate General Martin (O.R., 1, 49, pt 1, p. 1048), Union General Stanley (O.R.,1, 49, pt II, p. 309), and the Thomas Legion's Lt. Col. Stringfield (Histories of the Several Regiments and Battalions from North Carolina in the Great War 1861-1865, Volume 3, page 761) all recorded similar strength for the Legion. Apart attrition from deaths, diseases, wounds, and losses to Union prisons, the prisoners of war, sources show that most of the Thomas Legion deserters had rejoined the legion for the last hurrah. They had previously deserted -- returned -- to Western North Carolina to perform Home Guard duties, meaning to protect their families from bushwhackers and Unionists. They had protected their homes and families during the area's bloody anarchy and had rejoined the legion for the remainder of the conflict. 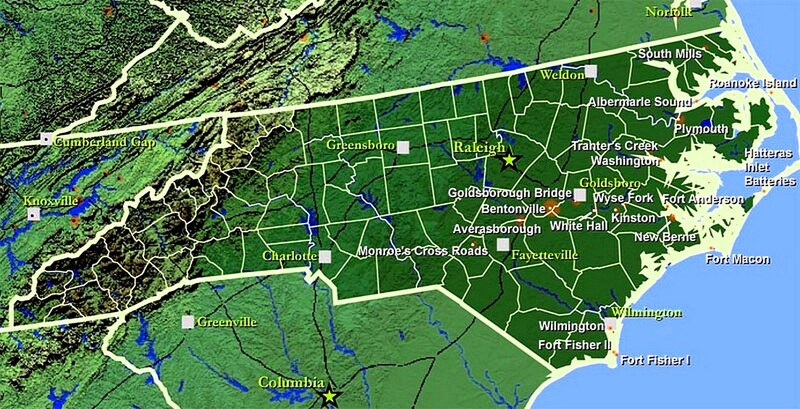 The legion was initially formed with the intent to remain near home and defend East Tennessee and Western North Carolina, but with exigencies of war, intentions and promises must be amended. On the morning of May 9th the Confederates desired another meeting with Bartlett, who was merely stalling with hopes that the Union 3rd North Carolina would arrive and reinforce his position. General Martin, who resided in Asheville until his death on October 4, 1878, with Colonels Thomas and Love, all met with Bartlett. The Confederate men understood that Lee had surrendered to Grant nearly one month ago in Virginia, but this was North Carolina and it was home, and after four years of death, devastation, and dastardly deeds in the region, the named men had their own terms to discuss with the Union colonel. Thomas, now physically and mentally drained from combat and the responsibilities associated with being both colonel to the legion and chief to his Cherokee, selected twenty to twenty-five of the most intimidating, largest Cherokees to accompany them to the meeting. Thomas, always wearing one-half hat colonel and the other Cherokee chief, pushed the meeting toward closure by having his Indian soldiers display their Cherokee customs by "stripping to their waists and then painting and feathering themselves." Stringfield admirably stated that "fortunately for our country, the Cherokee Indians inhabited the wildest section and were loyal to us to the last." Both the tongue-in-cheek and valid comment by Stringfield was according to Union papers that had been printing bizarre reports of savagery and much scalping from the Cherokee Indians, which, although false, did nothing to assist the Indians in obtaining their lands after the war. The media continued to use one broad stroke of the brush to group all Native Americans as uncivilized and incapable of even citizenship until 1924, a right that had been extended to African Americans more than 50 years earlier, but many have heard that the first shall be last. Thomas shared more words from his psychological warfare manual by affirming to Bartlett that "if your men don't surrender I will unleash the Indians to scalp your Yankee regiment! "The chief stressed that the men of his Legion will not surrender their arms nor equipment. But Thomas knew that it was only a matter of time before Union reinforcements would arrive, and after all Lee had already surrendered to Grant. Martin, a faithful North Carolinian indeed, quickly intervened and acknowledged that the parties could come to agreeable terms. Martin, having already written the Confederate surrender terms, gave them to Bartlett who then read the papers and acknowledged that he would honor the terms, but he did collect some guns and it was obviously a token gesture on behalf of Thomas to appease the Union generals. To state that Thomas was brilliant is correct, because he understood if Bartlett and Kirk did not present some Confederate guns and rifles to their superiors it could soon promote another Union raid through Western North Carolina, so presenting a few guns eventually appeased Union superiors, although they initially wanted more facts about so few guns. Thomas sent word to the Union inquiry and said that the Confederacy did not issue all the weapons to his men, but what they had was theirs, and they also needed their firearms to hunt and to maintain order in the area. See also O.R., 1, 49, ll, pp. 754-755. On May 10, 1865, Union troops capture Confederate President Jefferson Davis near Irwinville, Georgia. May 12, 1865, was the "The Final Surrender" for Thomas' Legion. The First Battalion's Company E soldiers signed the parole papers beginning on May 12, with the last signature recorded on May 14, 1865 (Thomas had surrendered on May 9, 1865). Captain Stephen Whitaker and Company E, First Battalion of the Legion were stationed at nearby Franklin, North Carolina. Whitaker and his company had recently Skirmished at Hanging Dog, Cherokee County, and were advancing toward White Sulphur Springs to reinforce Thomas when they were intercepted. General Tillson had ordered Colonel Kirk and the Union's 3rd North Carolina to Franklin (O.R., 1, Vol. 49, pt. II, p. 689), and when they approached the battalion Whitaker formed a skirmish line. But he too received word of Thomas and Martin surrendering at Waynesville, and then Whitaker and his company also joined the ranks of the surrendered. On May 14, 1865, the Legion's soldiers finished signing the paroles and they viewed Whitaker roll them up, tie them, place them in a Haversack, and give them to Kirk's Courier. "And thus at 10 o'clock in the morning of May 14, 1865, our Civil War Soldier Life ended and our Every Day Working Life began," exclaimed John H. Stewart of the Thomas Legion. The soldiers surrendered to Kirk understanding that additional fighting was futile and senseless, and, finally, the aftermath embraced the region. The Union forces never subjugated Western North Carolina, and, to this day, the Eastern Band of Cherokee Indians bestows honor and gratitude to their great white chief. Notes: Bartlett's highest attained rank was lieutenant colonel, but during informal communication it remains common practice to address the rank as colonel. Early in the conflict, Union sympathizers burned a number of railroad bridges, resulting in occupation by Confederate troops and abuses upon the Unionists and their families. The author documents in detail the ‘siege and relief’ of Knoxville. Although authored by a Unionist, the work is objective in nature and fair in its treatment of the South and the Confederate cause, and, complete with a comprehensive index, this work should be in every Civil War library. Sources: Official Records of the Union and Confederate Armies; Vernon H. Crow, Storm in the Mountains: Thomas' Confederate Legion of Cherokee Indians and Mountaineers; Vernon H. Crow, The Justness of Our Cause; Walter Clark, Histories of the Several Regiments and Battalions from North Carolina in the Great War 1861-1865; John H. Stewart Papers (Private Collection); National Park Service: Soldiers and Sailors System; Weymouth T. Jordan and Louis H. Manarin, North Carolina Troops, 1861-1865; E. Stanly Godbolt, Jr. and Mattie U. Russell, Confederate Colonel and Cherokee Chief: The Life of William Holland Thomas; The Thomas Legion Papers (thomaslegion.net/papers.html); The Civil War Diary of William W. Stringfield, Johnson City, TN: East Tennessee Historical Society Publications; D. H. Hill, Confederate Military History Of North Carolina: North Carolina In The Civil War, 1861-1865; North Carolina Division of Archives and History; National Archives and Records Administration; Library of Congress; State Library of North Carolina; North Carolina Museum of History; Digital Library of Georgia; Museum of the Cherokee Indian; Official Website of the Eastern Band of Cherokee Nation; Duke University; University of North Carolina (Chapel Hill); University of Tennessee (Knoxville); Tennessee State Library and Archives; Western Carolina University; North Carolina Department of Cultural Resources; John R. Finger, The Eastern Band of Cherokees; Robert J. Conley, A Cherokee Encyclopedia, UNM Press, 2007.